The reclusive country of North Korea is seeing a growing influx of information from the outside world, according to a high-profile defector, as South Korean pop culture is spreading among the North’s citizens. A recent press conference by former North Korean diplomat Thae Yong-ho revealed that an increasing number of North Koreans are watching South Korean dramas, which affects their daily lives. Hallyu refers to the popularity of South Korean popular culture, which has grown prominent in other countries, especially in Asia. It ranges from dramas, movies and K-pop to TV shows like “Running Man,” which has an especially large following in Southeast Asian countries. North Korea, one of the poorest countries in the world, has been controlling the flow of information from the outside world. This is to back its propaganda about the self-proclaimed excellence of the Kim Jong-un regime and the supposed malicious and depraved nature of other countries. Former North Korean defectors recently testified at a forum in New York that bringing in information from the outside world -- which often take place on the sidelines of smuggling -- is considered one of the worst crimes in the country. But technological advances and the growth of the black market in the hermit kingdom has made it more difficult to keep the citizens from accessing outside media. The South Korean Unification Ministry believes that the North’s central distribution system collapsed in the mid-1990s. One of the most popular means of enjoying Hallyu is said to be Notetel, a type of portable media player that plays DVDs and enhanced versatile discs. It was legalized in 2014 under the condition that it is limited to certain channels of the regime’s choice. 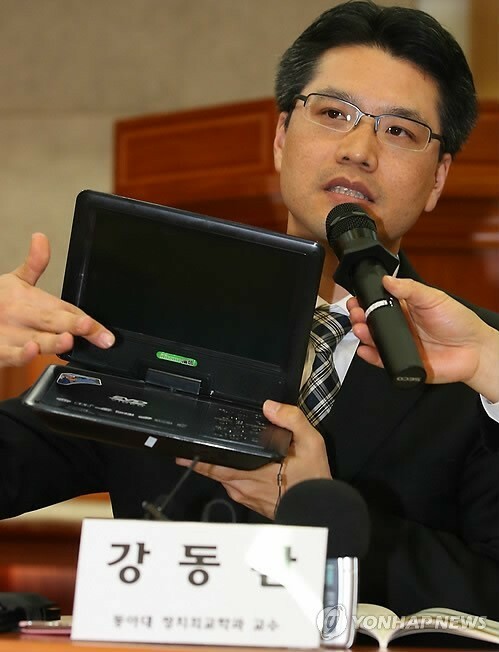 Thae testified that any North Korean who works abroad can easily access the internet via smart devices, although the regime urges them not to. They are, however, prevented from conveying the information they learned to others, due to the authorities spying on them upon their return to North Korea. “North Korea’s control over the internet is crumbling, and Kim knows it,” he said. Exposure to South Korean culture is affecting North Korean lives as well. According to Thae, young North Koreans even talk like South Koreans. Although the two Koreas have the same language, regional dialects and their 66-year separation have resulted in their citizens speaking in a very different manner. “They say words like ‘jagiya’ (honey), ‘oppa’ (meaning older brother, but often used to refer to a boyfriend or spouse), ‘kkk’ (the equivalent of ‘LOL,’ a social media abbreviation for ‘laughing out loud’), which don’t even exist in the North Korean language,” he said. Using these words is subject to the authorities’ crackdown, but Thae said it can be fixed by paying certain fees to the authorities. “North Korea attempts to control its people, but there are two things you just can’t stop. Drugs and Hallyu,” he said. He said the exposure to South Korean culture is slowly bringing the Kim regime down from the inside. “The Kim regime appears stable from the outside, but is rotting from the inside. ... We (North Koreans) hail Kim Jong-un during the daytime and watch South Korean films and dramas at night under blankets,” he said. Thae said this is why Kim keeps such close tabs on the country’s elites and executes anyone who falls out of line. “I was afraid that the ‘slave life’ will continue until the time of my grandchildren’s children. I told my family that I am severing the chains the moment I leave the embassy,” he said.